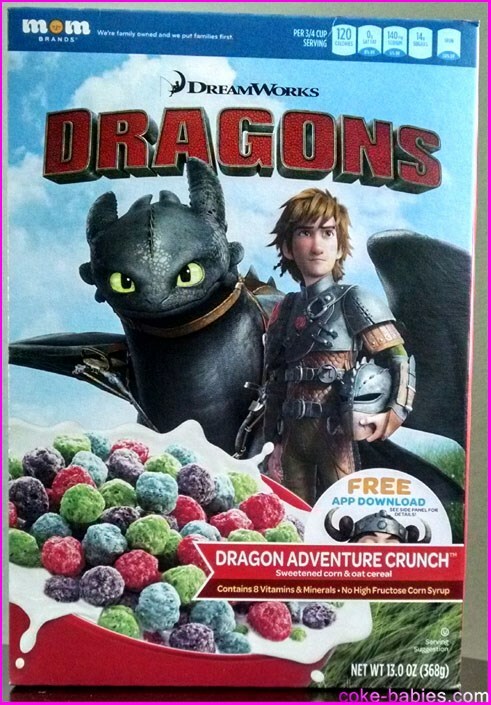 In a nice change of shelf-aesthetics pace, Walmart and Malt-O-Meal have teamed up to create a line of cereals based on Dreamworks’ movies. It’s a good news bad news situation. The bad news – all the ingredients (I think – more on that later) are just sourced from other existing cereals. The good news – cheap licensed cereals. Also, for fans of Malt-O-Meal, you finally get to enjoy purchasing cereal in a box. There’s four cereals in the line – I’ll go in order of least to most interesting. I never saw How To Train Your Dragon. I heard it was actually pretty good. I’ve also heard a lot of other movies are pretty good, and I haven’t seen them. Instead, I just watch Hackers and Demolition Man for the thousandth time. Also, at some point I guess the movies changed the name to just “Dragons”? I don’t know. Sorry for the lack of research – it’s not that I don’t care, it’s just that I don’t care. Box-wise, it’s nice enough. It has a dragon on it, so you can’t claim they’re ripping you off. It’s also got some Jim Halpert-looking guy in armor. Cereal-wise – it’s Crunch Berries. 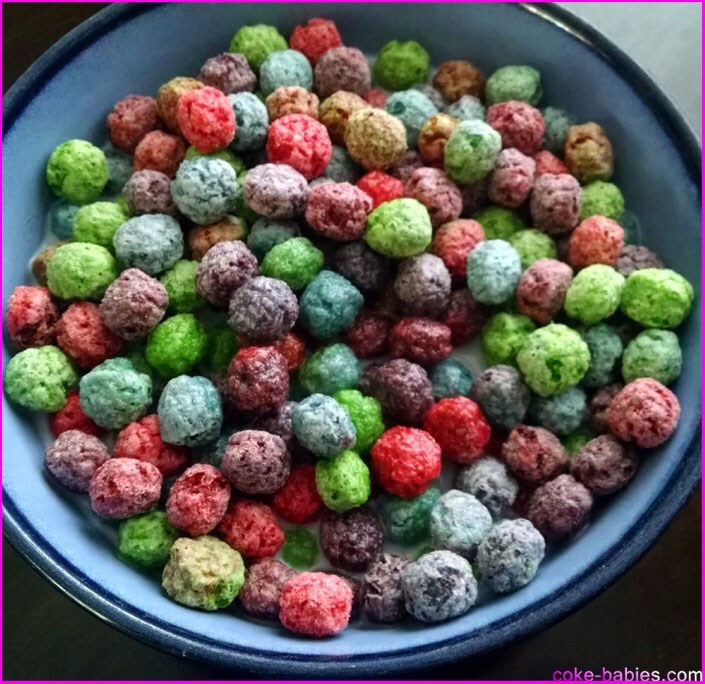 I never loved Oops All Berries, because I found that flavor annoying after a while. It’s a sad state of affairs when you need the already sweet Cap’n Crunch pieces to temper the berries’ sweetness in Crunch Berries, but at least that finds a good, albeit very sweet, balance. By itself, the flavor reminds me of if you let Hi-C simmer and reduce, then drank that. If you want fruity orbs, Froot Loops Bloopers are my go-to. 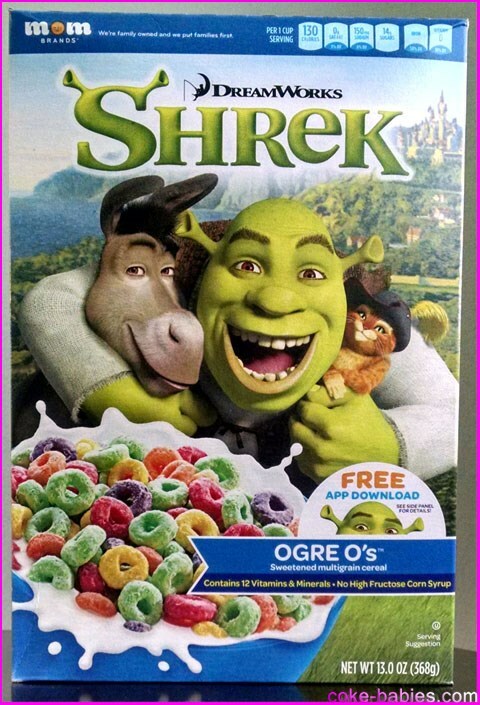 This is arguably less interesting than the Dragons cereal, but at least I’ve seen Shrek, so that got it undeserved interesting points. Box-wise, ugh. Look at Donkey’s face. Ugh. 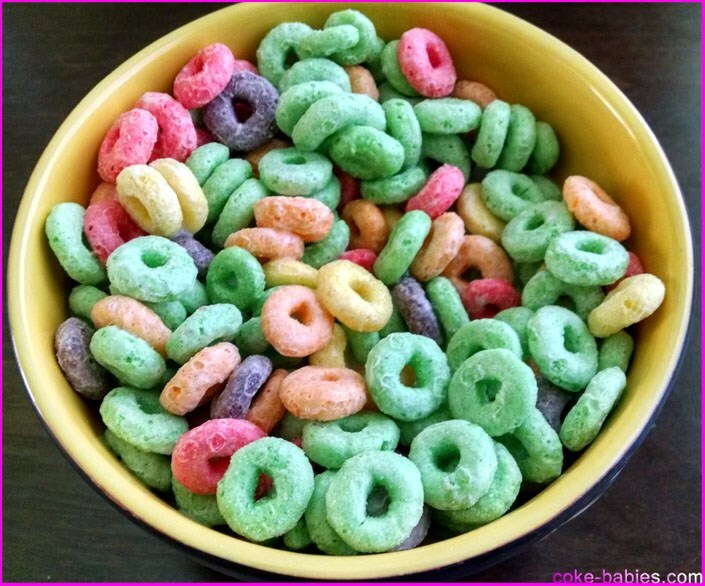 Cereal-wise, it’s Froot Loops. But with more green pieces. Because Shrek. I’ve never seen Penguins, but based on their faces, I don’t think I want to. Except the one on the left – he seems cool. He looks like Howard the Duck. 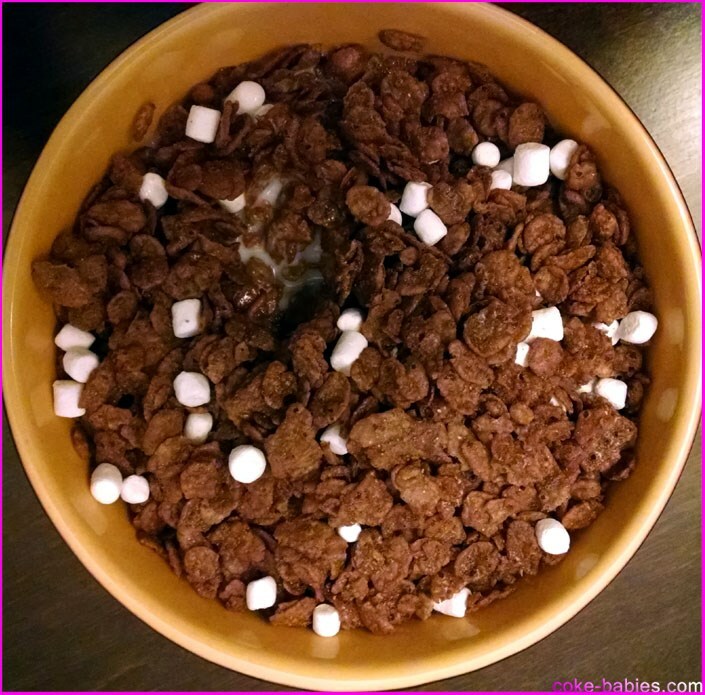 Cereal-wise, it’s Cocoa Pebbles with little marshmallows. I don’t know what Malt-O-Meal cereal these marshmallows might have been stolen from, but they’re awesome. I am not a big fan of real marshmallows, with their creepy softness. But dry cereal marshmallows, or those little dry marshmallows you get in a packet of hot chocolate? Those I’m down with. The marshmallows here are like hot chocolate marshmallows, just slightly larger and less dry. In the grand scheme of cereal things, they’re not necessary here, but they don’t hurt the cereal at all. Cocoa Pebbles are awesome, and the marshmallow addition is either easily ignored or kind of good, depending on how you look at it. And Cocoa Pebbles – sorry, Operation Chocolate Mix – makes probably the best chocolate cereal milk in the business, so it’s good from beginning to end. As per usual with most of these, I haven’t seen Madagascar. I hate all these characters’ faces, though. I’d give this cereal way more credit if it didn’t already exist as Malt-O-Meal’s S’mores cereal. Also, apparently Malt-O-Meal is called MOM Brands now. I probably should have mentioned that earlier. 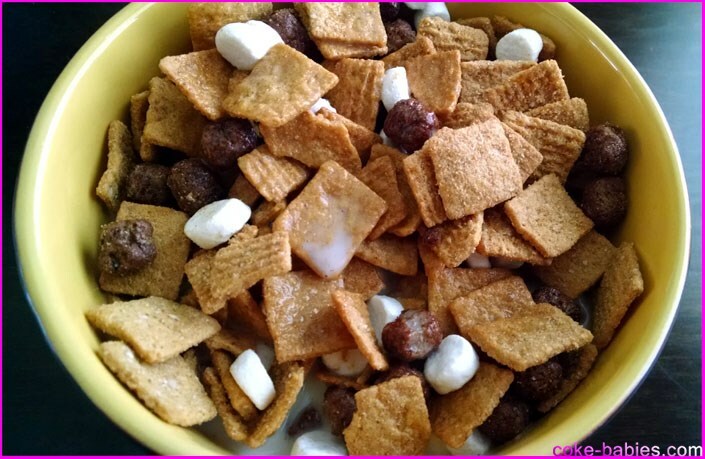 There have been plenty of S’mores cereals in the past, to varying levels of success. Currently, you can find S’mores Krave, and less recently you could get a S’mores Pebbles, Smorz (awful name), and way back when – S’mores Grahams / S’mores Crunch. 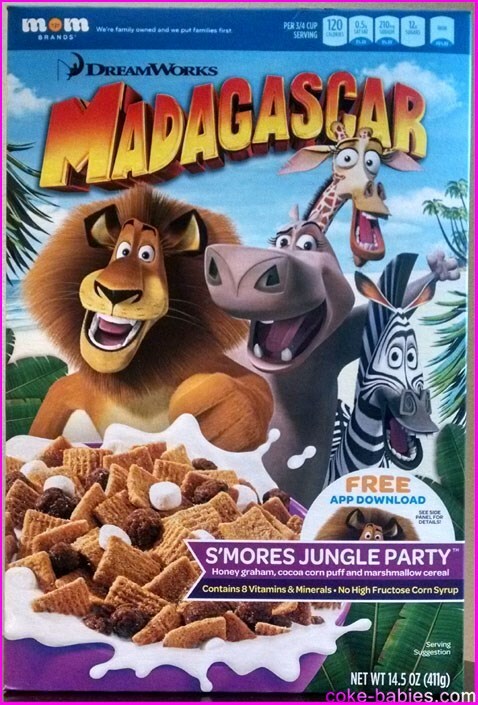 Despite just being a rebrand of an existing cereal, S’mores Jungle Party is a solid cereal. It’s got fake Golden Grahams – which are always great, fake Cocoa Puffs – which are always underwhelming, and marshmallows – which are creepy here. The marshmallows used are oddly soft for a cereal marshmallow. 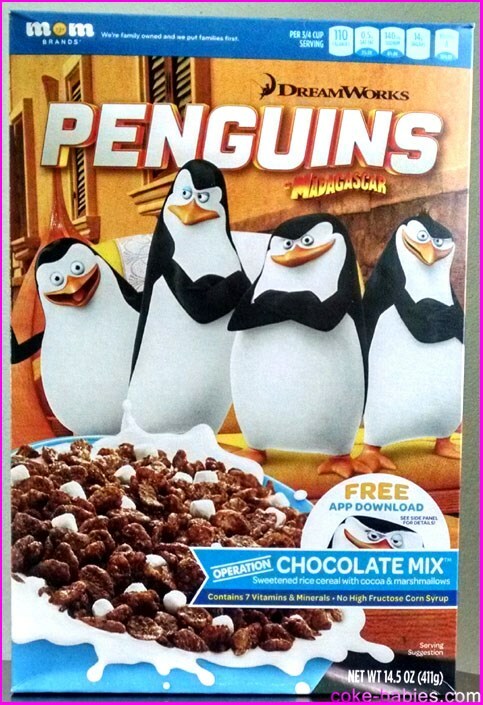 For this cereal, I’d have loved the hot chocolate marshmallows from the Penguins cereal. But overall, this is at least a more interesting cereal than some of the lazier ones we’ve seen. It’s nice to see some new cereals on the shelf, but I’d say the Dreamworks cereal line doesn’t really need to exist. It’s got some colorful repackaging, and I guess that’s cool if you like the movies, but cereal-wise it’s nothing new. I’d say that’s literal and not metaphorical, but I haven’t seen a MOM Brands cereal that is identical to the Penguins cereal. They make a Cocoa Pebbles with marshmallows, but the marshmallows are larger and shaped, so that’s not exactly the same. So I’ll say it’s literally the same, but with an asterisk. Seal of Approval-wise, eh. They’re a good price ($2.50), and you get a solid cereal with licensed characters. So don’t go out of your way for these, but the most I can knock these cereals for is being occasionally dull and just repackaged. Taste-wise, nothing wrong here.